Videos may contain graphic surgical content. Symptoms may consist of a sensation of light-headedness, spinning (vertigo), or feeling unsteady and losing your balance. There are many causes for dizziness and inner ear pathology is just one of them. A thorough history, physical exam, and tests are required to determine the correct etiology. Benign positional vertigo is a spinning sensation that occurs with changes in head position such as tilting your head back or turning over in bed. It is related to loose “calcium crystals” within the inner ear that can be repositioned with a simple non painful procedure in the office. Sudden hearing loss can be also be associated with severe dizziness. This is a medical emergency and patients need to be started on treatment as soon as possible to help prevent permanent hearing loss. Sometimes it may be an indication of a serious condition such as a Brain Tumor or Acoustic Neuroma. Ménière’s Disease is another common inner ear problem. It causes repeated bouts of vertigo, loss of balance, roaring/ringing in the ears, and sometimes progressive hearing loss. Simple and effective treatments in the office are now available to reduce the intensity and frequency of this chronic debilitating disease. Note: Vertigo and dizziness may be a sign of stroke, multiple sclerosis, seizures, a brain tumor, or an intracranial bleed. In these conditions, there will often be other symptoms that will accompany the vertigo or imbalance. Septoplasty and Turbinoplasty are surgical procedures to improve nasal congestion. They are performed from within the nose, and patients have no external facial bruising or swelling. The surgery takes about an hour, and is usually done on an outpatient basis. No packing is used on a routine basis anymore. Some congestion inside your nose after surgery is normal. Postoperative instructions will come from your doctor, who may recommend saline nasal irrigations and an antibiotic lubricant. Elevate your head with a few extra pillows or sleep in a recliner the first few days after surgery to help relieve congestion. Please do not blow your nose for 5 days after surgery. As well, avoid heavy lifting, straining, or strenuous exercise. If you need to sneeze, open your mouth as this reduces intranasal pressure. Stop taking aspirin and other similar medications such as Motrin, Ibuprofen, Eleve, at least a week before surgery as It slows clotting and increases the chance of bleeding during and after surgery. Tylenol is okay. The Adenoids are lymphoid tissue located behind the nose and soft palate. An Adenoidectomy is often done with a tonsillectomy. Adenoids may also be removed in children with nasal congestion, snoring, recurrent sinusitis, and frequent ear infections. Recovery from an adenoidectomy is quick and relatively painless. Children can go back to school within a few days. Sinus surgery may be necessary on an urgent basis when complications of sinusitis develop. Less urgent sinus surgery may be indicated when chronic sinusitis fails to respond to medical therapy. CT scans are very helpful in determining which sinuses are diseased. It can also identify obstructive or abnormal cells that can cause sinus pain or headaches. Nasal endoscopy is also used to obtain cultures, determine cause of sinus pain/headaches, and identify treatment options. The late 1980’s and early 1990’s marked the evolution of Endoscopic Sinus Surgery, a minimally-invasive approach to surgery for sinusitis. This is sometimes referred to as Functional Endoscopic Sinus Surgery (FESS). It was quite a significant advance compared to prior open sinus procedures performed at the time. Simply explained, it involves removal of diseased tissues in key areas of sinus obstruction. Endoscopic Sinus Surgery is performed with the goal to reestablish physiologically normal sinus drainage pathways. The surgery is performed using fine instruments called endoscopes (small, rigid telescopes) which are inserted into the nose to open the sinuses. The scopes are attached to a camera allowing the surgeon to visualize the sinus cavities in a magnified form on the screen, while operating with fine instruments. There are several advantages of Endoscopic Sinus Surgery over the open sinus procedures that preceded it. First, it provides great improvement in the ability to see within the nose and sinuses. No longer are facial incisions with resulting visible scars or gauze nasal packing used. The surgery is done through the nostrils and there are usually no visible signs that surgery has been performed. Recovery is usually faster, and there is less postoperative pain and bleeding. Sinusitis affects millions throughout the world. Balloon Sinuplasty is a new technique that is being used by the doctors Huntsville Ear, Nose and Throat to help the patients suffering from sinusitis. The principle on which this technique works is same as that of balloon angioplasty. Doctors use a small inflatable device for widening a congested sinus osteum. Narrow channels allow individual sinuses to drain into the nasal cavity. Soft tissue within this opening or channel can swell up when affected by an infection or allergy. This results in narrowing or complete blockage of the passageway. As a result mucus starts collecting within the sinus, and the normally air filled cavity gets filled with fluid. This gives rise to sinus pain and congestion. 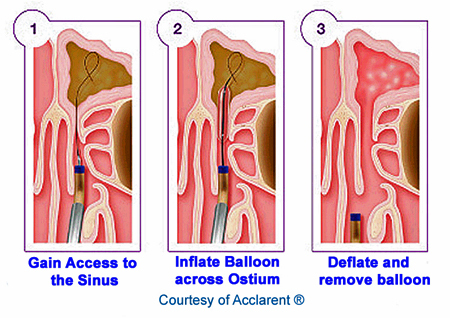 In this technique, a (1) catheter and wire are used to gently insert a small uninflated balloon into the sinus opening through the patient’s nostril. Then the (2) balloon is gradually filled with air so as to expand to about 5 mm. This expansion gently pushes surrounding soft tissue and bones apart. Hence the opening into the sinus gets dilated. (3) As soon as the opening widens the balloon is deflated and gently removed. The retained mucus is drained and the patient is relieved of symptoms. This is great news for those who suffer from sinusitis.